This topic contains 21 replies, has 8 voices, and was last updated by Dimples67 10 months, 1 week ago. Hi all, I’ve just found this forum and am hoping this will help keep me on the straight and narrow. I’ve always been a big girl and fairly fit, but I’m finding my weight at 50 is affecting my health. High-ish blood pressure and cholesterol. Good for you! I’ve found it really helpful too, the support on FDs can be good if you’re flagging! Good luck Dimples67. I started Monday and am hoping the forum will help me keep on the straight and narrow too :). I ended up browsing on here today as it’s a fast day, am about to go shopping and telling myself ‘I can fast tomorrow, I’m feeling tired, so I need some nice munchies’. Have some leftover potato and broccoli in the fridge so am planning an omelette for dinner, having a recipe in mind is helping, need to plan better lol. Welcome to Fasting, Dimples and hestia. If you want to lose weight, this lifestyle works. And then you will get the other benefits. Ham & Cheese Bake: 266 calories 6.5 g fat 2.2 g fiber 13 g protein 33 g carbs 275 mg Calcium GF This is the baked version of the ham&cheese omelette. Just as good, only one egg per person. Set toaster oven at 350 degrees F. Grate the cheese and chop the ham. Whisk together the cheese, egg, and seasonings. Spritz some cooking spray into an egg coddler or ramekin or custard cup, and pour the egg mixture into it. Bake for 12-18 minutes, depending on how well set you like your eggs. It will puff up and start to brown a bit. Heat your beverage, shake the smoothie, and portion the fruit. Enjoy a good start to the day. Put the olive oil, onion, carrot, celery, garlic and pepperoni into a sauce pan together and cook over medium heat until onions begin to wilt. Add the sweet potato, zucchini, mushrooms, tomatoes, white beans, herbs, and water. Cook at a simmer for about 20 minutes. Add the pasta and cook until it is soft. Add remaining seasonings. HINT: One serving is one cup, but you could go to 1 and ¼ cups each. This recipe made 4 cups for me – several future meals from one prep! Hi Guys, Lovely to hear from you. Fasting me – those recipes look great I’ll be sure to try them on my NFD. 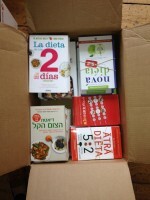 I may be the only one on this site who hasn’t read the fast diet book and could be going about it the wrong way?? I am using low calorie meal replacement shakes to get me through the FD, with plenty of water. I can’t quite go without my morning coffee (milk and sugar).. I know I’m terrible! I’ve also dropped breakfast during my NFD’s and am not struggling with this. I’m finding hunger pangs a bit of a hurrah sensation. Do you think I need to revert to the “proper way”? Dimples, I’m a proponent of real food. You should read the book — you will find it to be very encouraging. And if you think you are on the wrong track, read the book! I see nothing wrong with milk and a 1/2 tsp of sugar in my morning coffee: that’s every day, Fast and Slow. Try eating my recipes on a Fast Day and see how they work for you. I will invest in the book and look at ‘real food’ options. HI I JUST JOINED THIS FORUM AND WOULD LIKE TO KNOW IF ANYONE HAS HAD TROUBLE WITH JUICING. I AM NOT FASTING OR DETOXING. I AM JUST TRYING TO EAT HEALTHY AND DRINK MORE VEGE JUICE. WHEN i GET UP IN THE MORNING MY TONGUE IS DRY AND ABRASIVE.MY THOAT STICK TOGETHER. WHAT CAN I DO TO REMEDY THIS? Hi, Karen. Welcome to Fasting. As for juicing, if your machine removes the fiber from the plant matter, leaving you only juice, then that is not a good thing. We use a Vita-Mix [high-powerd motor] to make fruit smoothies in the morning. No added sugar or flavorings. At lunch on Slow days, I make a Green Milk Smoothie [lettuce, apple, date, milk] Why juice instead of eating the vegetables? For hydration, water is still the best thing. First thing in the morning, we drink what we call ‘elixir’ which is an old Vermont recipe. We mix it up in quantities to last several days. Recipe: 6 cups warm water, 1/4 cup honey, 1/3 cup cider vinegar. Once mixed, we keep it in the ‘fridge. Every night, I put a cup of it on our bedside tables. Very refreshing in the morning. No, we don’t count those calories on a Fast Day. Fasting in snowy NH: Today we had egg-avocado-crab-cottage cheese baked in a dish for breakfast. Really fast and easy. Tonight we’ll have a variation on ‘mixed sushi’ with brown rice, grilled beef, smoked salmon, egg, and cucumber. After not really losing much for the first couple of weeks, I’m gradually seeing a kilo or two start to shift. I’ll carry on with my fast-shakes until I get the book and decide how to do fasting with eating real food. How are you getting on Hestia? Hi, just dipping in here with my first week results. Just thought I’d hop on the scales this morning to see how I’d done……3.2lbs off this week so I’m chuffed with that. I know I won’t lose this every week but it gives me such a good start and will make me carry on. Hi all, It’s the first time doing this fast diet that my blood sugar has crashed and I felt pretty awful for 40 min or so. I don’t know if it’s because I had a flu shot today or if I didn’t have enough Carbs last night…? Anyway got through it without caving and having something sweet like I would have before. I’ve looked at a lot of the posts put on by other Faster’s and it seems there are varying types of FD’s. Some liquid only, which is kind of what I’m doing. In a way I feel more in control if I have only liquids and don’t have to think about food and how many calories it would have. Hi Dimples67 – My blood sugar often dips around 20 hours into a fast. It rarely lasts more than an hour and I’ve found exercise helps. However one has to be careful because sometimes the low blood sugar can leave one a bit light-headed. I think this mainly happens when the liver is out of glycogen stores and then has to shift to producing some glucose. With exercise, the muscles will use their stores of glycogen which produces lactic acid. The lactic acid can be converted back to glucose in the liver in a process know as the Cori cycle. Normally the glycogen stored in muscles isn’t ever released. However the waste from the muscles using it has to be removed by the blood. So I think of it as a way to get at the stored glucose that is normally locked off. I was glad the wobbliness didn’t last long and your explanation is very interesting. The human body is an amazing thing. I missed a fast day last week and was quite grumpy in myself. But back on track this week and the scales haven’t punished me too much for my slip up. I’m having a wee bit of trouble with waking up before 5am and feeling super awake, so I sneak into the lounge, trying not to wake my husband and have a wee browse on the forum. Great to read others journeys and feel a little part of it all. I’m having a girly trip to Brisbane in July and am using this event to focus my eating habits. Will be great if I can actually buy some clothes that aren’t in the big girls section?? Here’s hoping. I’ve been awake since 4.30am, does that happen to anyone else after a fast day? It’s a nice quiet time to catch up on FD forum and see how your all doing, but a little early! Glad it is going well for you, Dimples. I find the thought of counting calories depressing but I think not doing so has slowed my weight loss progress. I’ve found some recipes and plan to make some yummy low carb meals, or at least make an effort to eat that way on my NFD’s. I’ve got one more month until our girls trip in Brizzy(Brisbane), this can be a focus for improved meals. I am in my first week of the 5:2 diet! I’m feeling good after completing two fast days as I never thought this was something I could do! I’ve never been good at sticking to diets and my biggest weakness is pasta and cheese!! However, I’m finding the 2 fast days much more sustainable and easier. I’m pretty active but I have found since leaving university three years ago, I can’t eat whatever I want like I used to! I’ve put on weight around my stomach and thigh area since starting a new job where lunch is provided and is very tempting! I’m going on holiday in 5 weeks so hoping to lose as much as I can so that I feel confident in my bikini next to my beautiful friends! Any tips and words of encouragement are welcome! I’m really hoping this works! Welcome, Catriona. Sounds as if you are well under way to Fasting. What appealed to my ODH about Fasting was the fact that it was only 2 days/week. i too love cheese and eat some every day for the Calcium. One oz at lunch time, sometimes some in food. You should find that over time, your appetite will decrease, making it easier on Fast Days and Slow Days. Work on portion control to avoid over-eating. Dimples, for YEARS I counted calories! At least it gave me a good sense of how much some foods ‘cost.’ If you have a FitBit or some other such, their app has a calorie counting section [food tracking]. You type in what you ate for a day or a meal, and the tracker tallies it for you. That way you don’t have to look everything up. How is it going, Hestia?